Issue: Water drawn from a well and in some cases municipal water supplies may contain ferrous or “clear water” iron. Water that is clear when drawn but changes to a yellow or rusty color upon standing is known as ferrous or clear water iron. This iron has not yet been exposed to oxygen and therefore has not “rusted” or oxidized. Ferrous iron is totally dissolved in water, and is readily converted to ferric iron (red water iron) in the presence of any air or oxidizing material. It doesn’t take much time to realize that you have iron in your water supply. 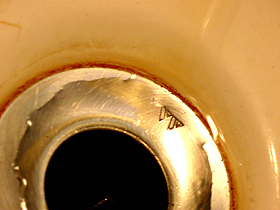 Rust and black colored stains on sinks, toilets and showers, metallic taste and stains to laundry are clear signs that you have iron or manganese in your household’s water. Iron and manganese sometimes occur in water together. It is important to note that everyone’s water supply can be different. Contact us for a complete analysis of your water supply. This allows us to customize the your water treatment system to your specific needs.